The heat of the scorching summer sun has made it difficult to go out. During the week the sky was covered with clouds which has raised humidity to 32%. Highest temperature was recorded at 45°C and lowest was at 29°C. Wind was at 18 km/hr. 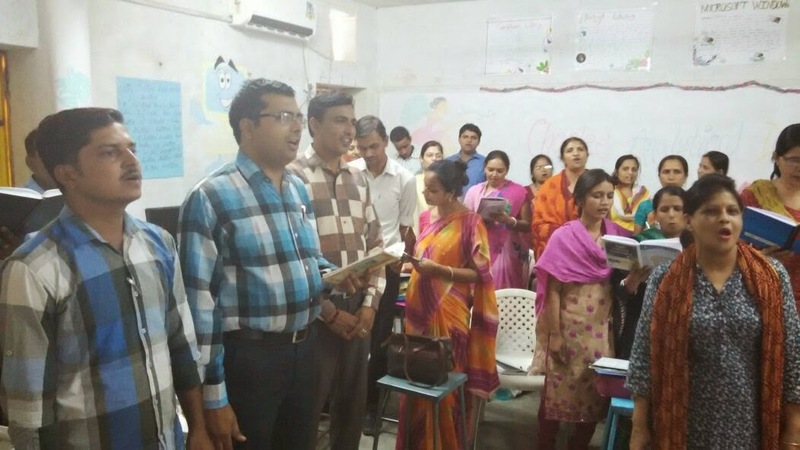 The Fabindia School started summer training for teacher’s on 11th May 15 with English proficiency and information technology classes. In English proficiency classes Mr Mithilesh Patro is training teachers with telephonic teaching, interactive classroom teaching by correct pronunciations and breaking spelling. He is trying to modify speech habits by tongue twisters, English songs and group activities. In information technology classes Mr. Sandeep Singh teaches various steps to improve teaching efficiency with technology in classroom. Now a days it is one of the most preferred method of learning. I think through this English proficiency and information technology classes teachers feel more confident in their classes and can make their teaching more effective. We all know that English and IT is very essential for everyone. We mostly use it but we don't know how to properly use it. Thanks to the Principal Ma'am and Chairman Sir that they organized this training for us. I have learnt many new words, pronunciation, framing questions, correct use of sentences, new technical terms in Google Drive like how to create and upload a file and folder. I raised my level of confidence and conversation skill in a group. This year through our English and IT Training I have gained lot of confidence. I have learnt pronunciation of words and also learnt how one can improve English through songs, tongue twisters and grammar. In IT I have learnt to use Google Drive so I can share my work with my colleagues and improve my lessons using the new technology. I want to thank Principal Ma'am for giving us the opportunity to improve ourselves. English Training has helped me to add on in my knowledge. I have learnt a lot in phonetics which will be a help in my English teaching in Classes. I am happy that through this English training my colleagues will also improve and we all together as a team will be able to raise the quality of teaching in the school. IT teaching is very essential for us. I am not good at Computers, but this IT training will help me to work on Google Drive and will be able to improve my lessons using the new technology. I want to thank Principal Ma’am and all those behind the curtain for giving us this opportunity to become more efficient. This was the second week for the English Proficiency Classes. Mr. Patro is doing his best to improve the pronunciation of the teachers and to help them converse in English comfortably. For that he arranged an Skype Conversation with his sister Eenakshi and her family who stays in Vancouver in Canada. All the teachers were divided into five groups who would converse with Eenakshi one by one. 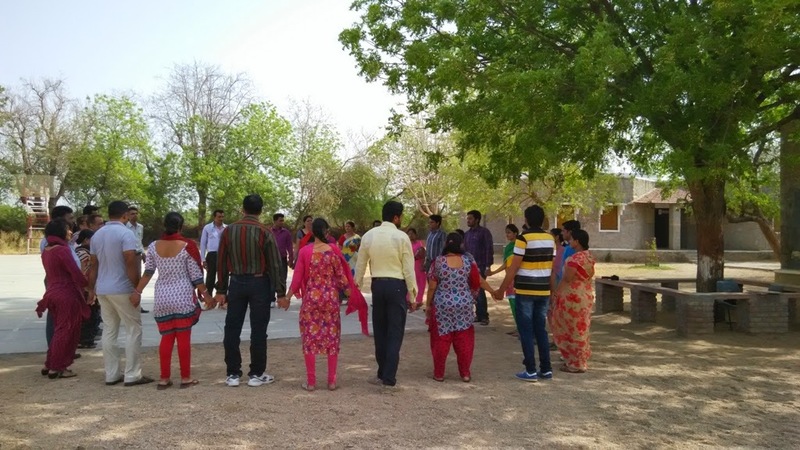 This exercise was done to help the teachers to converse and open and come out of their shell.On the first day he gave three keywords CONFIDENCE, VERSATILITY and AUTHORITY. He mentioned the importance of English Language. Why should we use it. The class was divided into five groups with a group leader. Teachers were asked to jot down their expectations from the workshop. In the five days workshop a lot of phonetic drill took place, to help teachers articulate correctly and clearly. One can see some changes in teachers already. Their diction is clearer. Most of the Hindi Language teachers have also started conversing in English by using simple words and sentences. Teachers are enjoying the workshop as it has been made more musical by singing songs. Singing songs is not only helps in pronouncing words but it is also helps to learn English easily. 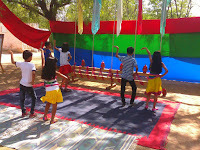 It has also taught teachers how they can make their class more interesting and musical. Wednesday, 20th May: After the circle time Group One went for the Skype conversation. 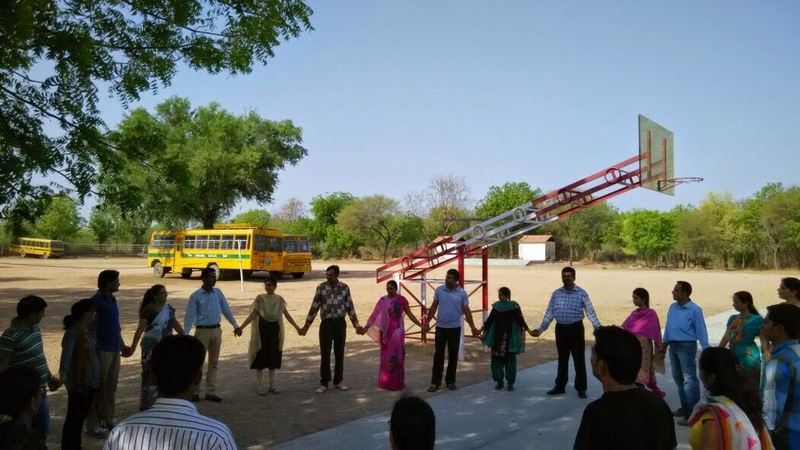 The teachers of the group were Mr. Byju Joseph, Ms. Kavita Deora, Ms. Usha Pawar, Ms. Priyanka Mahatma and Mr. Amit Bhatnagar. B : I am Byju Joseph. I teach Science here and I am the Academic Dean. Basically I am from Kerala I have two children a boy and a girl. My wife is a nurse. E : OK! Have many Keralites as friends. Idli and Dosa are very famous in Kerala. I tried to make them but I could not make them properly. B : Please tell about your family. E : My husband is working in ICBC as an insurance person. I have two children. Both are boys, one is of 16 years and the others is of 14 years. B : OK Thank you Ma’am. Kavita : Hello Ma’am, how are you ? Eenakshi : I am fine tank you. How are you? E : What do you teach ? K : I am mother teacher of class I. I teach English and E.V.S. E : What is E.V.S. ? K : E.V.S. is Environmental studies. E : Tell us something about you . K : I am basically from Bangalore. This is my mother-in-law’s place. I have two children. Both are boys. E : Oh Wow! That is a nice place. I had been to Bangalore. My husband’s niece stays there. She works in Britania Company. She told me that she stayed on Brigade Road. 100 Feet Road and been to Defence Colony. Amit : Hello Ma’am, how are you ? A : How is climate of Canada ? E : It is very hot but not so hot comparison to Rajasthan. A : Why do you left India ? E : I left India because I found new job opportunity as a ECE teacher in Canada. I have worked in Oman. Country school run by Sultan of Oman where by I am transferred to Canada. A : What’s so special about Canada. E : Canada is a very beautiful country here a mix of community people. They are Chinese, Indian, Pakistan etc. A ; I am a Computer teacher and teaching Classes from VIII to XII . E : What Computer language do you know? A : The Computer language that I know are C, C++, Java, Aspionet, C# etc. Usha : I am Usha. I am an Art and Craft teacher. Eenakshi : That’s a nice subject. Which class do you teach? E: What do you teach in Art and Craft. What have you made? U : Paper folding, Paper maching, Wood carving, soft stone carving, clay modeling. E : Oh that’s lovely. U : I showed stone carving made by students. DT and learnt shape. Colorful pot was shown, flower vase, flower made of papers. PMA: Hello Eenakshi, I am Priyanka. How are you? E: Hi Priyanka, I am fine. How are you? PMA: I am also good. E: So tell me Priyanka what do you teach? PMA: I am PGT Economics of Class XI –XII. E: Oh Good! So you teach about money and all.That is great. So what is your qualification. PMA: Professionally, I am management people, and have done BBA & PGDM in HR+ marketing. E: Why didn’t you join the corperate side? PMA: I am a girl child so my parents didn’t sent me. E: That was the same problem that I faced when I was shifting to Canada even my parents were not ready but later they agreed. PMA: Do you like to visit church frequently? E: Not frequently but every Sunday I visit it. PMA: I also like church. I also wish to see one. Nice to talk with you. Summer is at its peak. It is difficult to go out in the scorching sun. During the week the sky was covered with clouds. Days have become hotter with highest temperature recorded at 45°C and lowest temperature at 29°C. Humidity is at 21%. Wind is blowing at 14km/hr. ED: What was the picture in your mind of the teachers you were going to train before you visited The Fabindia School? MP: I had a vague picture as to what to expect because I had done a similar intensive course in Jalore. The teachers there were mostly from a Malayam background whose pronunciation was typical from the area they were from. Therefore, I had a brief picture, as to what to expect in Bali as Ms. Deepika Tandon had already mentioned that I will have teachers from a traditional Rajasthani background for whom English was not considered something as important as compared to Maths and Science. That was the picture that I had in my mind when I came to Bali and to an extent it was quite correct. ED: When you reached here and taught the teachers and conversed with them, you find it? MP: I found the teachers as I had expected. Probably it was not important to them that they should be conversant with English. When I was introduced to the teachers I impressed upon them that though they were not fluent they should be comfortable with English and should be able to communicate in English as they are teachers. Once they started their course they slowly got it into their heads, that yes, English is an important language not the cost of other languages, but in relation to the work that they are doing as educators, as teachers; because they have to have Confidence which gives them the Authority to command and impart knowledge and the Versatility to obtain information from any source . I am glad they have imbibed this and are putting it into practice so I definitely see a change. They are improving by leaps and bounds. Usha came up centre stage gave a presentation; she is a person who usually finger reads. But yet she came and spoke without any notes or aids and was concise and quite clear. I felt humbled by her effort. ED: After five days of your workshop with the teachers what are the changes that you see? MP: The teachers are speaking up now and they have no hesitation in taking center stage and presenting their views. They may not be quite grammatically correct, but they are trying hard. I am glad to say that the concept of using big words for the sake of using them has been done away with. They have got this concept of using simple English and correct English. ED: One thing I would like to ask you that are Rules of Grammar important to learn and what are your views about it? MP: Rules are necessary, they are a form of guidelines. We have to have rule books. Unfortunately in India the teaching of English Grammar has become a different subject in itself. Grammar is taught for the sake of rules and four or five examples are given to buttress those rules. There is no course where English conversation and a lesson of listening where you see and hear words being formed from a person’s mouth is taught. We feel that if we have learnt Grammar we have learnt English. That’s quite misleading, we are good exponents of grammar rules, but absolutely atrocious "pronouncers" of the English word. ED: What do you say about Circle time? MP: Circle Time is very necessary. It is a time when it draws the people out of their shells. A lot of teachers who speak in front of their students go into their shells when public interaction is involved. Circle time is when they come out of their shells breaking their barriers of tradition and difference of cultures and gender, etc. You have to have circle time as it brings them close. Holding hands brings one close. You can’t be a teacher if you can’t influence or get close to other people. ED: On your observation give us a feedback. MP: I have seen teachers trying hard. Usha is someone to whom I raise my hats off to. A 50 plus craft teacher, a finger reader trying hard to read with a finger and to keep up with the speed of the other teachers, today gave a speech without the help of any aids. I was a bit worried when I saw Byju, a person of substantial authority, but I see him accepting instructions willingly. Ajay and Raj have also shown a change in them. I was able to convince Raj that as Science is a precise subject and the terminology is in English and so it is important she should learn English. I have tried to change the mentality of the teachers to use simple words and simple sentences. It is not imperative that they look into a Thesaurus or Synonyms and use bombastic words. I have emphasized that the use of simple words and sentences leads to correct English. Thank You Sir for all what we have gained from and hope to gain more in the coming days from your teaching. 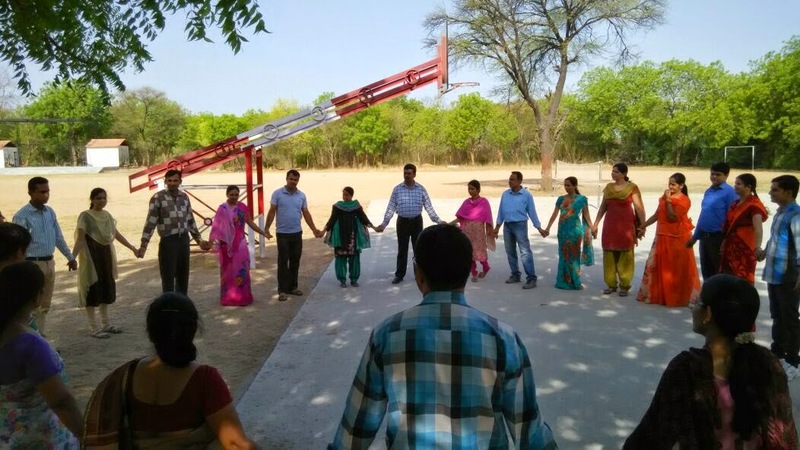 The teachers’ summer training started on 11th May’15 after the School closed for Summer Vacation. The training started with ‘English Proficiency classes’. This training is to improve pronunciation, converse correctly and speak unhesitatingly. The workshop started with Circle Time and Mr. Mithilesh Patro’s introduction, who will be our mentor during the year. On the first day he gave three keywords CONFIDENCE, VERSATILITY and AUTHORITY. He mentioned the importance of English Language. Why should we use it. The class was divided into five groups with a group leader. Teachers were asked to jot down their expectations from the workshop. In the five days workshop a lot of phonetic drill took place, to help teachers articulate correctly and clearly. One can see some changes in teachers already. Their diction is clearer. Most of the Hindi Language teachers have also started conversing in English by using simple words and sentences. Teachers are enjoying the workshop as it has been made more musical by singing songs. Singing songs is not only helps in pronouncing words but it is also helps to learn English easily. It has also taught teachers how they can make their class more interesting and musical. Mr. Byju Joseph: I am learning how to modify speech habits. I learn meanings of few words every day and correct pronunciation of some words. Ajay Vijaywargi: I am learning to to correct pronunciation of many words and sang a song in public after years. Krishen Gopal Dave: I learned the meaning of some new words and learning to pronunciation by songs. Surendra Singh: I am learning to that we should use simple words to converse. I am learning to vowel sounds. Dinesh Bharti: I am learning to use simple sentences for daily conversation. I am learning to to the correct pronunciation of words. It is very good and helpful for me. Gajendra Mewara: I am learning that conversation must be done by using simple and small sentences. I used tongue twisters to learn to speak fluently. Anuradha Rajpurohit: I am learning to use some new words and pronunciation. I am learning to use Simple Present Tense and tried to make simple sentences by using it. Raj Ranawat: I am learning phonic sounds; how to make sentence and how to talk in simple way. Dilip Singh Inda: I am learning to speak in grammatically correct English . I am learning to speak fluently. Urmila Rathore: I am learning phonetic sounds and correct pronunciation. English songs and enjoying! Prena Rathore: I am learning some new words and pronunciation. English songs. Suresh Negi: I am learning vowels sounds. Uses of is, am, are, was and were. Imran Tak: I am enjoying how use a single word with different parts of speech. I am learning how to use simple sentences while speaking. Usman Gani: I am learning to make sentences with simple word. I am learning to use some phonetic sounds and words and English songs. Tarun Mishra: in last week I have learnt that when you speak in English language our mouth should open fully; for better teaching we should use simple words in simple ways. Kavita Devda: I am learning to frame questions in past, present and future tense. I am learning to speak clearly and enjoying the English songs. Kusum Sharma: I am learning to make simple conversation simple through small talks and how to break the spellings through sounds. In IT class I learnt few basic steps like making new file/folders, copy, past and editing text. Ayesha Tak: I am learning to use vowels in phonetic sounds. I grow up my confidence level. In IT class I am learning to work on Google drive. I am learning to sing some English songs every day. Kusum Dangi: I am learning to sing some English songs and enjoy singing . I learnt vowels sounds and phonetic sounds. Amit Bhatnagar: I learnt some English songs and tongue twisters, I learnt “small talk”. I learnt parts of speech. I learnt use of tenses. I learnt phonetic sound words. Usha Pawar: I am learning to use some new words and phonetics sounds. My confidence level has grown. Rakhee Bhatnagar: I am learning to use vowel and phonetic sounds; how to use tenses, making conversation with anybody and some lovely English songs. Sharmila Vijaywargi: I am learning to use tenses, pronunciation of different words, phonetic drills and most importantly that I have confidence building in me. Rajeshwari Rathore: I am learning to use vowel sounds, phonetic sounds and Simple Present Tense. My confidence level has grown. Punita Chouhan: I am learning to use some vowel sounds, Simple Present Tense; group conversation with sentences. I like to sing English songs in groups. Tongue twisters are a good tool to improve my spoken English words. Thanks for helping. Kanik Goyal: I was able to improve my Grammar and learn some English songs. Priyanka Mahatma: I am learning to use some English songs and parts of speech. Monika Vaishnav: I am learning to correct my pronunciation. I am learning some lovely English songs. Babulal Deora: I am learning correct pronunciation. I am learning English songs. Bharti Rao: Through this English Proficiency Training and phonetic drill I am able to polish myself and this learning will help me to make my classroom teaching more efficient. Tongue-twisters and English songs helped me to recollect my schooldays. Thanks a lot for all the learning provided to us. Summer is at its peak. Scorching sun has taken the life out of everybody. Days are longer, hooter, while nights are shorter but not so cool as Rajasthan would experience. Highest temperature recorded was 44°C and lowest at 29°C. Humidity was at 19% and the wind blew at 14km/hr SW.
Thursday, 7th May: Mr. Dinesh Bharti and Mr. Gajendra Mewara returned from Delhi where they had gone to attend the Solid Waste Management and Green School Workshop, organized by CSE, Delhi, for one day on 6th May’15. They were given certificates by the Principal in the Assembly. They also shared their experience and advised every student to participate in making the school green. Friday, 8th April: A Special Assembly was conducted to mark World Red Cross Day. Blessy Maria/XI/DH, Kritika Mansion/X/GH, Radhika Singh/X/GH, Shivraj Singh/X/TH and Khushi Rao/X/GH on what Red Cross Society promotes humanitarian principles and values; Disaster response; Disaster preparedness and Health and Care in the Community. The School thanks all those students, teachers and peons who gave their monetary contribution for cancer patients and for this good cause. ED: How was your experience with the Class when you visited? AJ: When I visited the Class II, I was not experienced in what we call in America ESL. English is a second language in India. So to see the teacher say a sentence in English, then the children repeat it was really very interesting. When it was necessary she would speak in Hindi and most of the time the teachers would speak in English. I was impressed to see mostly the entire little children could read English and I call this is a good way of teaching. The teacher of Class II Ms. Sharmila was a very forceful, energetic and very interactive teacher. And the teacher of Class I was little different, she was more quiet but the children were paying attention. I have seen two different styles of teaching. ED: What are your views about the Indian education system and American education system? How can we compare both these systems? AJ: I can say this is a huge question. I can barely think about that. I don't know much about schools. Well the school I remained in the most was quite informal, so by comparison this school seems formal. But I think it’s much less formal than many Indian schools. And I am impressed with the eagerness and excitement in the school students. I think that I see more here than I do in America. ED: What suggestions would you like to give us to develop the school? AJ: That's a very hard question because I feel so new to be here. I guess one of the ideas is to encourage more creative thinking in students and less emphasis perhaps on repeating back what the teacher said. More attention should be paid to creative thinking. But I am very impressed with the school. I haven't seen yet the art work of the school, but I was a photographer myself and an artist. One must age as an artist. Art is important for me. And I yet don't know what place art has in this school for I have not seen it in the school. ED: How old is the JBSF? AJ: Oh! Dear you asked me another hard question and I don't know the answer. My understanding is that John's sister Marie originated this - the person always In Charge of the fund. I don't know when it started. I was not a part of it in the beginning I was asked to join it about 5 years ago. We meet twice a year, we meet at John sister’s house. I and Marine talk about how the fund is going and how more charges we can add to raise the fund. Katherine Allen is her mother and she is the one who really can answer where I can ask the question at the beginning of the JBSF fund. But mostly the donors friends of the family or relatives who are the donors. We have never gone to ask help from any other organizations to raise funds. ED: Do you also face some challenges in raising up the funds? AJ: Yes, I think at the moment we are limited by a circle of friends and me need about other sources. I think we need to be get connected to the Indian American Community. And need to be make contacts with Mr. Sandeep Dutt to see funds there. ED: Are the members of JBSF till now only Americans? ED: Do the donors ask any questions when they give funds? AJ: This is a sort of house-keeping question. This is the confusion what to tell the donors. Originally, we used to say that you have to give 250 dollars which will go to a rural school. But Mr. Dutt said it is a kind of marketing. We need to educate our donors that they are contributing to the educational world. ED: When they give money are they interested to know right to the digit zero? Where the money is going or how it is used? AJ: I don’t think so, particularly. They come to know by looking at the website. Honestly we get so many requests for funding from so many organizations. It becomes so over warming, so we ask Katherine to make a Newsletter full of human interest. .
ED: What message would you like to give to the students and staff? AJ: Congratulation for building a wonderful school. I am so impressed. And good luck will live to continue. The school is wonderful. It is so calm, peaceful. The students act independently. I am just impressed .A lot of change has come. I would love to come back next year and see the Art Work. 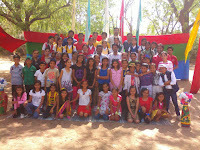 Friday, 8th May: Students of the Pre-Primary Section went on a picnic to Dantiwara. 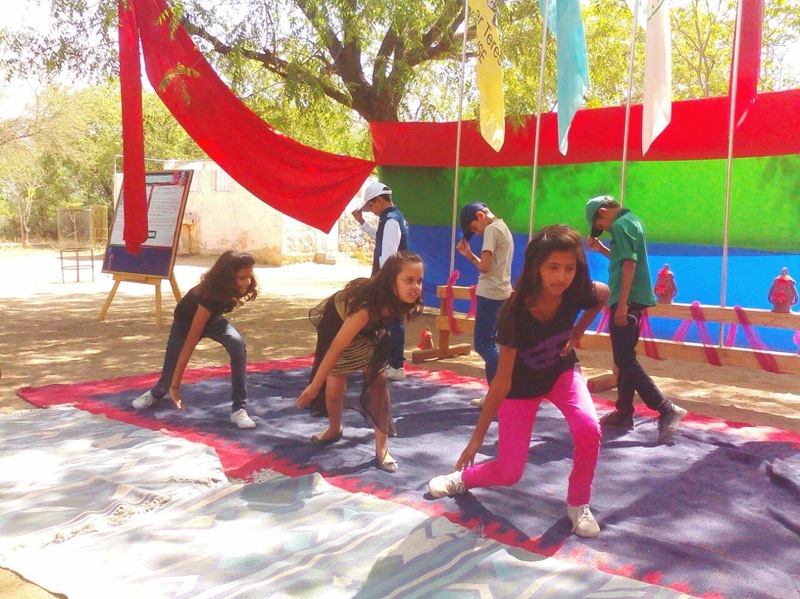 The students enjoyed and had fun in the heart of nature. 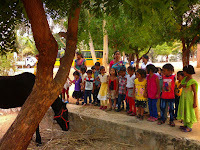 They also saw many different kinds of animals, plants flowers and trees. Many games were organized for them. On their return to school a small prizes giving was organized, where they were distributed prizes for the activities held during the month of April/May. 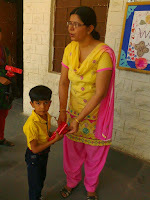 Saturday, 9th May: Mother’s Day which is held on 10th May was celebrated in advance as it was School’s last day. Khushi Rao/X/GH sang a song dedicated to Mother “Tu kitni Aachi hai tu kitni bholi hai, pyari pyari hai” and Pooja Dutta/XI/GH spoke how did Mother’s Day originate and why it is celebrated all over the world. School wishes Archana Koratkar/VI/GH and Khushbu Chouhan/VI/TH A Very Happy Birthday! School sang a song for them in the Assembly. Prize Distribution for students of the Primary Section was held to honour student winners in the Inter House Recitation Competition and Lemon Race organized in April /May. 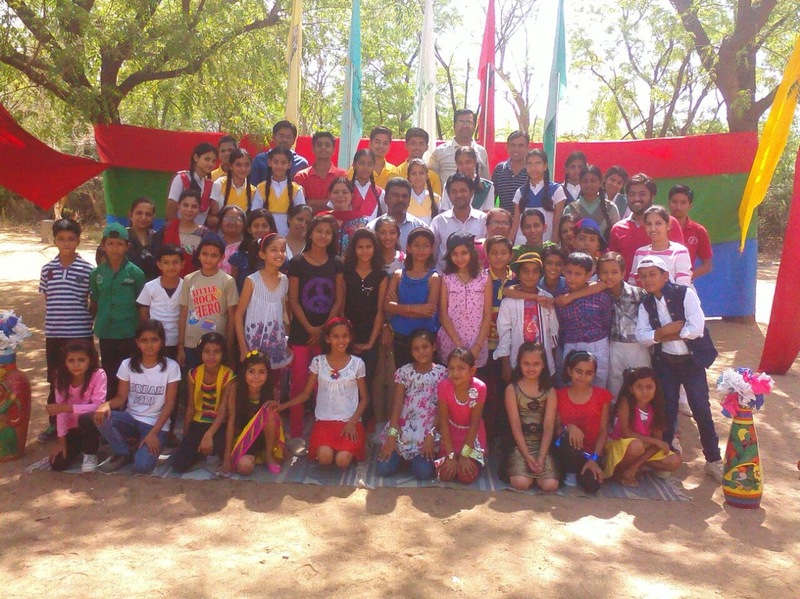 150 students had participated in the National Art Festival organized in the School December 2014. School received it awards, medals and certificates. All the students were awarded participation certificates. Three students were awarded Gold Medals for making beautiful greeting cards. Khushi Rao/X/GH, Parineeta Sheikh/X/GH and Ankush Sirvi/III/RH were awarded Gold medals. We are proud of Ankush Sirvi/III/RH as he not only bagged a Gold Medal but was also awarded a cheque of two thousand rupees for his beautiful Art work. Holiday homework was given by teachers in all the classes. It was the last day for the students. I’m incomplete without my mother. Is a dare some task. You may go and ask. Monday, 4th May: DEAR was held as usual. FA1 was conducted in all the classes. Tuesday, 5th May: FA 1 continued. Friday, 8th May: Editorial board meeting took place in the Lunch Break, in the Principal’s office, where correspondents were promoted to editorship. In July the board will meet again to choose its new correspondents. NOTE: The School is closed for Summer Vacations from 11th May’15 to 30th June’15. The School reopens on 1st July’2015. Bali is experiencing hot, bright and sunny weather. Even the mornings and evenings are very hot. Temperature during the evenings and mornings is at 36°C. Every week temperature is shooting up by 2°C. Highest temperature recorded was 44°C and lowest at 29°C. Humidity was at 11% and the wind blew at 10 km/hr. Thursday, 30th April: It was planned to celebrate the birthdays of the students of Class nursery to V on the last day of each month. So the birthday of all the students that fell in the month of April was celebrated on 30th April in the Junior Campus. 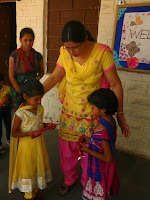 The birthday students cut the cake, danced and distributed chocolates. All the students enjoyed the day. Saturday, 2nd May: Junior Inter House Western Dance (group) Competition was organized on Saturday for the students of Class III to VI. Just in two days practice the students put up a fabulous show. The show was meticulously put up. There were 6-8 performers from each House. 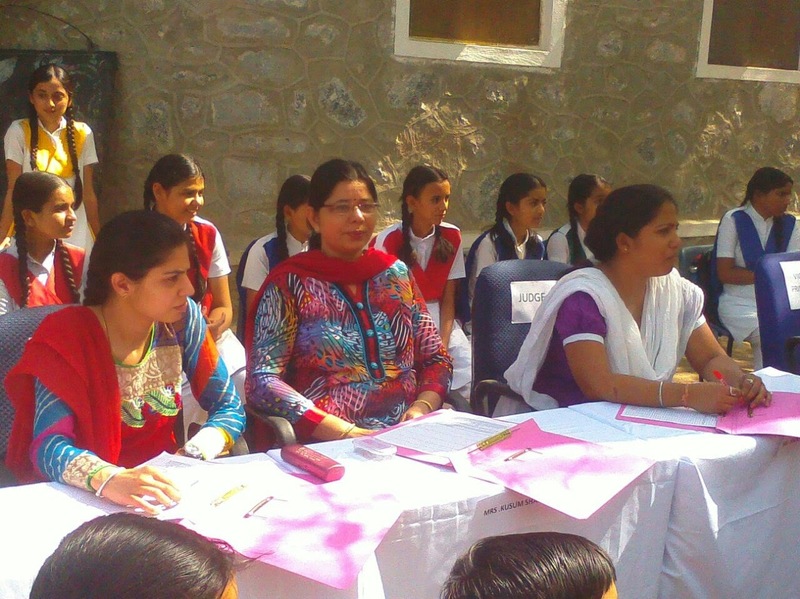 Ms. Swati Sood (HR & PA), Ms. Priyanka Mahatma (Economics Teacher) and Ms. Kusum Sharma (Junior Coordinator) were the judges for the Competition. Aryan Singh/VI/DH anchored the show. After the Competition the school attended Western Vocal Music Classes, Stitching Classes, Computer, Sports and Art & Craft Classes. why they are so absurd? and this difference is because I never feel shy. Why people tell me to feel shy? Do they not want me to try? I am fed up of their thoughts. And want to give my ideas a shot. I want to make use of all that I was taught. And want to enjoy like a bird a lot. So never be scared of absurd thoughts. Monday, 27th April: DEAR was conducted in all the classes. It is catching pace slowly after a break of one month. Tuesday, 28th April: Regular classes were held. A separate music room was setup in the Junior School Campus. 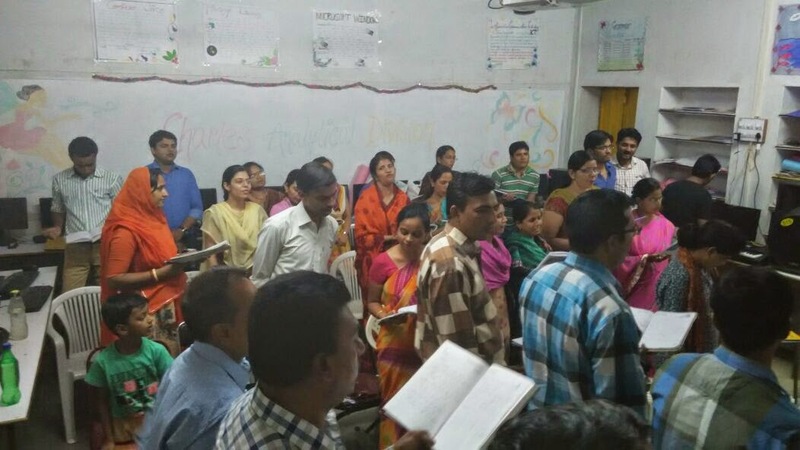 Music classes were taken by the new teacher Mr. Prakash Dangi. Students were taught about musical instruments like Congo, Casio, Tablas, Harmonium and Dholak. School welcomes Mr. Dangi to the school community and hope he has a rewarding time. Wednesday, 29th April: As it was World Dance Day a special Assembly was organized. Khushi Rao/X/GH, Krithika Mansion/X/GH, Shivraj Chouhan/X/DH spoke on different dance forms such as Classical Western Dance etc. on this occasion.